When Darby Partner decided on the plan for her son's birth, she knew she wanted to keep his placenta attached to him until it broke off naturally -- a process known as a "lotus birth." "I did it for energetic reasons," Partner, a certified professional midwife who now lives in Hawaii, told CBSNews.com. "To me, I felt like it would be really special to prolong the time the placenta and baby were together, and to have him let go of the placenta when he was ready and not have any metal scissors involved." In a typical birth the umbilical cord is cut shortly after the baby is delivered, severing the child from the placenta, which is an organ that's responsible for providing nutrients and oxygen to the fetus while filtering out waste, carbon dioxide and other gases. The small piece of umbilical cord left attached to the baby eventually dries out and falls off on its own. 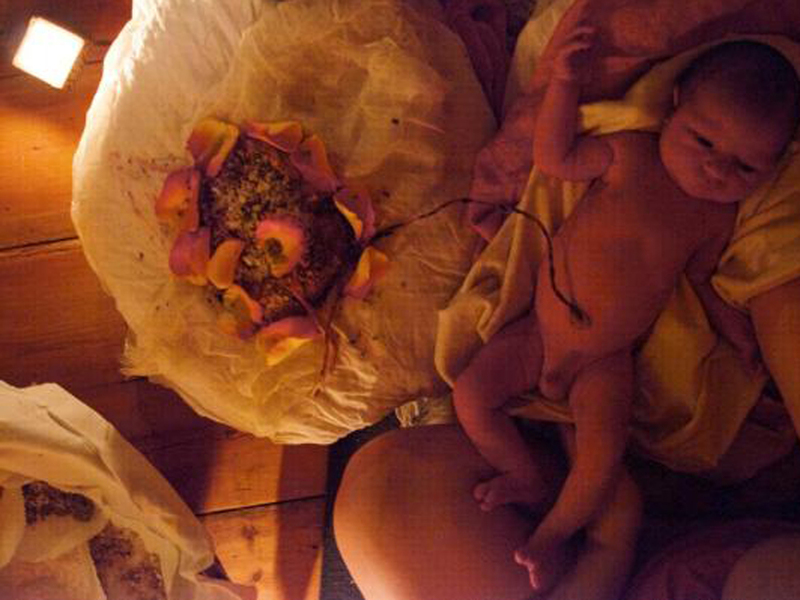 Lotus birth practitioners keep the entire cord and placenta in tact after delivery. Not including her own child, Partner has assisted in at least a half dozen other lotus births. She explained that after the mother gives birth to the baby and the passes the placenta, the placenta is rinsed with cool water to remove all the surface blood clots. Then it is placed on a piece of absorbent cotton, where it is allowed to dry out for about 12 hours. Later, to mask the smell, Partner likes to cover the placenta with a thick coat of sea salt and herbs like lavender, rosemary and rose petals, and then re-wrap it in cotton or in a customized bag. "It was just like a big lavender sachet," she said, recalling her son's placenta. "It didn't smell at all. It's sort of like preserving salted meat." It might sound strange to have a newborn who is saddled with a placenta, but some lotus birth advocates argue that this might be a better way to birth a child. Partner said that stem cell rich blood still exists in the placenta shortly after birth, and allowing the umbilical cord to stop pulsing and transfer all the existing nutrients might not be a bad thing for both mom and baby. Also, because it is hard to move the placenta and baby around, the mother is forced to stay near the child and not move as much. This could aid in her recovery and the bonding experience with her child. In addition, it's a way to limit the number of visitors who want to come and visit the child. "This allows for undisturbed bonding without distraction -- which is crucial for successful breast-feeding," Mary Ceallaigh, a midwifery community educator from California, told CBSNews.com. However, Dr. Joseph G. Ouzounian -- an associate professor and chief of the division of maternal-fetal medicine at USC Keck School of Medicine in Los Angeles -- explained to CBSNews.com that there's no evidence lotus births are beneficial. "You're essentially flying blind," he said. "There's no data. It's not impossible there is a benefit, but it really hasn't been studied well." Zoe Mantarakis, who had a lotus birth with her second son, said being forced to "lay in" helped her and her baby connect. "The wrapped-up placenta was almost like a 'lovie' for my baby. It was a cuddly soft thing, connected to him, and cozy in cloth," she said to CBSNews.com. Ceallaigh noted that some women will opt for a short or partial lotus birth, in which the baby is eventually severed from the placenta after waiting four to six hours for the cord to stop pulsing. In long lotus births, which is what Partner and Mantarakis had, patients wait for the umbilical cord to break off on its own, which typically happens in two to five days. Partner's son's umbilical cord broke in just 2.5 days. Recent research has shown that delayed cord clamping may provide benefits for the baby. A study showed that infants who delayed immediate clamping had higher hemoglobin levels -- and therefore healthier blood -- and were were less likely to have an iron deficiency within six months after birth. They were also more likely to have a higher birth weight. They did however have a higher risk of jaundice, a yellowing of the skin and eyes caused by the buildup of a blood byproduct. Ouzounian pointed out that delayed cord clamping in that study typically meant 30 seconds to one minute after birth, not days. The Royal College of Obstetricians and Gynecologists (RCOG) issued a statement against lotus births in 2008. One of the potential risks was increased odds of infection since the organ is just lying there. "The placenta is particularly prone to infection as it contains blood," Dr Patrick O'Brien, RCOG spokesperson, explained. "Within a short time after birth, once the umbilical cord has stopped pulsating, the placenta has no circulation and is essentially dead tissue." Ouzounian also said that blood in the placenta clots, which may cause thromboembolism to occur. This is when a piece of the clot may break off and travel through the umbilical cord into the baby, plugging the lungs, brain, gastrointestinal tract, kidneys or leg and causing other serious complications. Once a child is born, he added, their circulatory system changes and they no longer need the placenta. Keeping it around might mean the child is diverting blood to an unnecessary organ. "People can do whatever they want to do -- bury the placenta, some people make omelets out of it, whatever... I'm kind of libertarian, do whatever you want to do, but if you ask for my medical opinion, I have to give you the science," he said. "You are entitled to your own opinion, but not your own facts." Michelle Castillo is an associate editor for CBSNews.com.